A Newport Rhode Island Wedding is always a memorable event. Newport is a seaside city on Aquidneck Island, which is located in Newport County, Rhode Island. Newport has been known as a summer resort for affluent families throughout history, and is especially recognized for its famous mansions. A Newport Rhode Island Wedding often is able to offer couples and guests the classic feel of historic Newport, with a contemporary twist. The Newport wedding pictured displays the groom having the time of his life under a lavish reception tent. The tent is made up of solid beams that attach to the main house at this particular venue. This allows wedding attendees to enjoy the outdoors and beautiful Newport scenery, without having to give up the luxuries that come with an indoor reception. The polish wood dance floor gleams under the white tent canopy. Lanterns hang from the beams that make up the ceiling of the tent and glow above the guests who circle about the floor to watch the groom show off his dance moves. 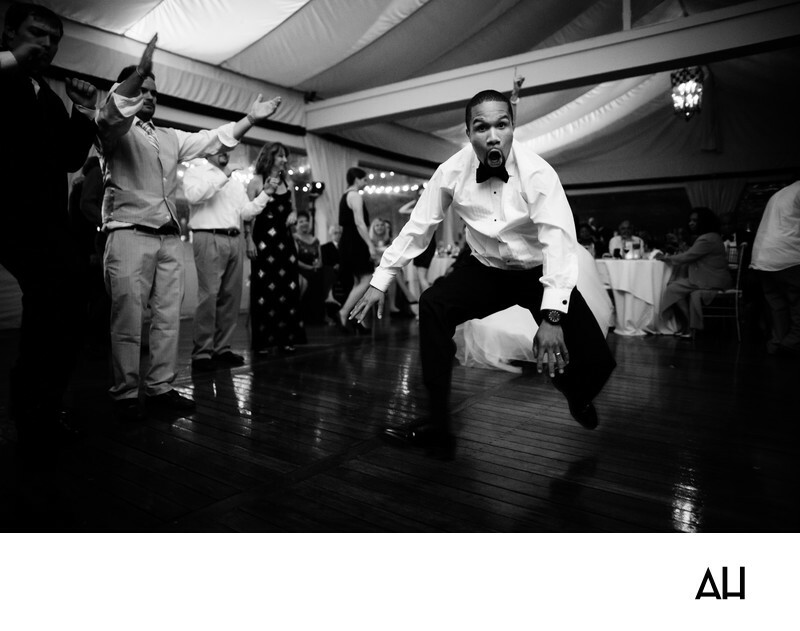 The groom is at the center of the floor, frozen by the flash of the camera as he jumps into the air and moves with the rhythms of the song that fills the space of the tent. The guests who stand around him cheer the groom on and clap to the beat of the music. The black and white photograph is telling of the fun that was had at this reception, and the joy that made the day one that the bride and groom will cherish.